February is the month of LOVE! I LOVE inspirational romance stories, so this is a perfect month to share one of my favorite authors with you….Tina Radcliffe. I LOVE her amazing faith-filled books about romantic LOVE and the LOVE of families. If she’s a new-to-you author, I hope you’ll read one of her stories. I think you’ll be hooked! And because I LOVE my blog readers, I’m giving away one Kindle ecopy of Her Last Chance Cowboy to a reader. See the details below. Her Last Chance Cowboy with White Chocolate Chip Cookies. Her Last Chance Cowboy is a book I could not put down! REALLY GOOD! When two hurting hearts collide, the sparks fly! I think I held my breath for the whole story, praying these two could find a way to happiness. Quiet, stay-in-the-background Tripp Walker tugged my heart in earlier books, so I was excited to read his story….and what a story it is! He is handsome, protective and hurting. He believes he can’t have a relationship. Hannah Vincent has secrets from a past life where she was manipulated. She’s trying to hide by staying on the run to protect her adorable daughter, Clementine. Hannah is strong, fiercely independent, and searching for a home. I loved the emotional roller coaster of escalating tension between Tripp and Hannah. Just when I thought all would work out….BOOM…the crash of two strong personalities happened. Can Hannah and Tripp find it within themselves to trust and forgive? Hang on tight! You’ll love the ending….soooo much! Each the four stories centered at Big Heart Ranch have touched me….”a ranch that healed so many hearts.” This is a special place of second chances…for children and wounded people. Author Tina Radcliffe know how to bring the reader into the lives of the characters to feel their emotions and understand their thoughts. In this story, Dutch and Rue were special friends to the couple as they sought the path to happiness. We all need friends like them for help along the way! If you like warm, humorous stories of faith and second chances, you will definitely like Her Last Chance Cowboy…plus there’s chili, red velvet cake and Sonic cherry limeades! I loved this book! *I was given a copy of this book with no requirement to write a review. These are my honest opinions. Leave a comment and enter the Rafflecopter form for a chance to win a Kindle ecopy of Her Last Chance Cowboy to be delivered after the Kindle release date of March 1, 2019. By entering, you accept the legal terms as stated on the Legal Page of my website. US residents only. In last month’s post, I mentioned my 2019 One Word…JOY! This month I’m focusing on joyful LOVE. 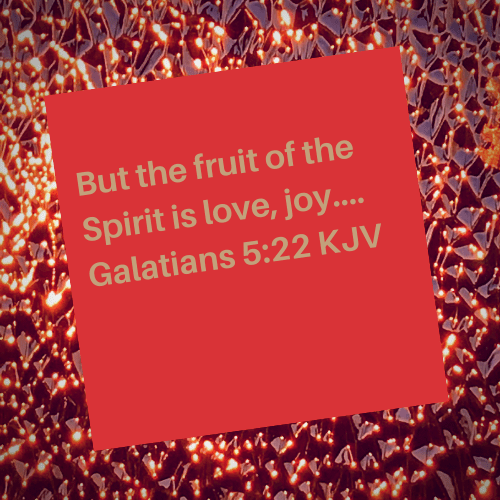 Today’s Bible verse combines LOVE and JOY. February is the month we celebrate LOVE….the many facets of LOVE…..for romantic love, love of our precious families, for our special friends, for our sweet pets, and for all we hold dear. Most important is God’s LOVE for us, as He shows us in so many ways. He promises we will find JOY if we embrace the LOVE He extends to us. Thank you for loving us and giving us second chances. Thank you for surrounding us with so many expressions of love. Thank you for loving us enough to offer eternal life with You. Help us to reflect Your love so others will come to know You…to rejoice in Your enduring love and grace. Thank you for joining me for tea, treats, and my review of Her Last Chance Cowboy. May you walk in LOVE AND JOY, receiving these treasured blessings from our Lord. I just had to include a photo of these LOVABLE pets, our granddogs, rescue Shelties, Gumshoe and Bitsy. Aren’t they adorable? *Comments are appreciated and will be visible after moderation. I apologize for delays in posting. Welcome to my #TuesdayTea review of author Laurie Wood’s debut…NORTHERN DECEPTION. 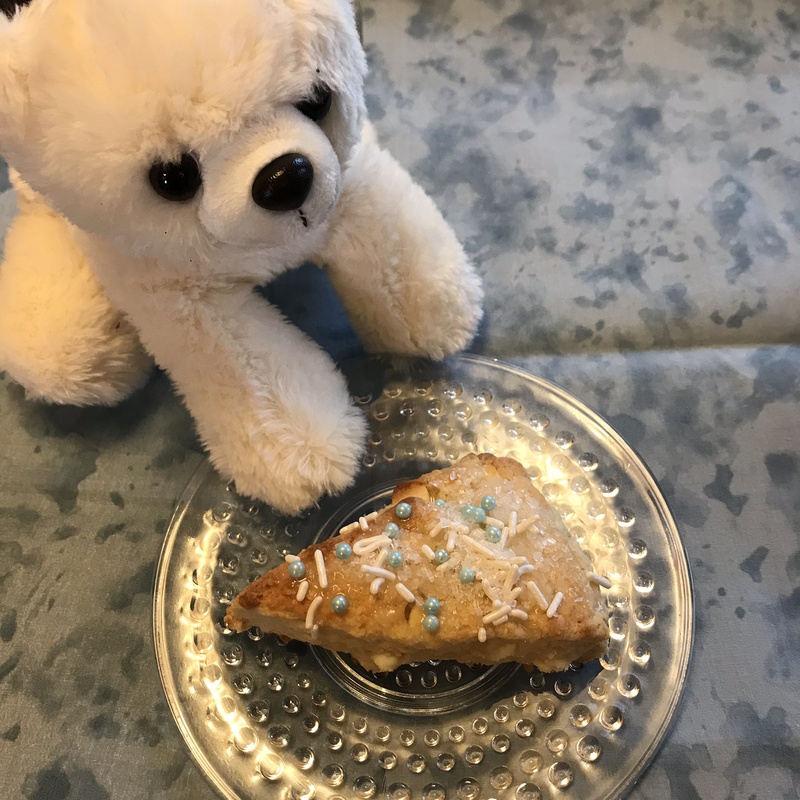 In keeping with the setting for this book…the arctic area of Canada…glittering with white snow…I’m serving Sparkling White Chocolate Scones. Please help yourself to a couple of treats while I pour you a cup of Twinings Buttermint tea, perfect with these seasonal scones. 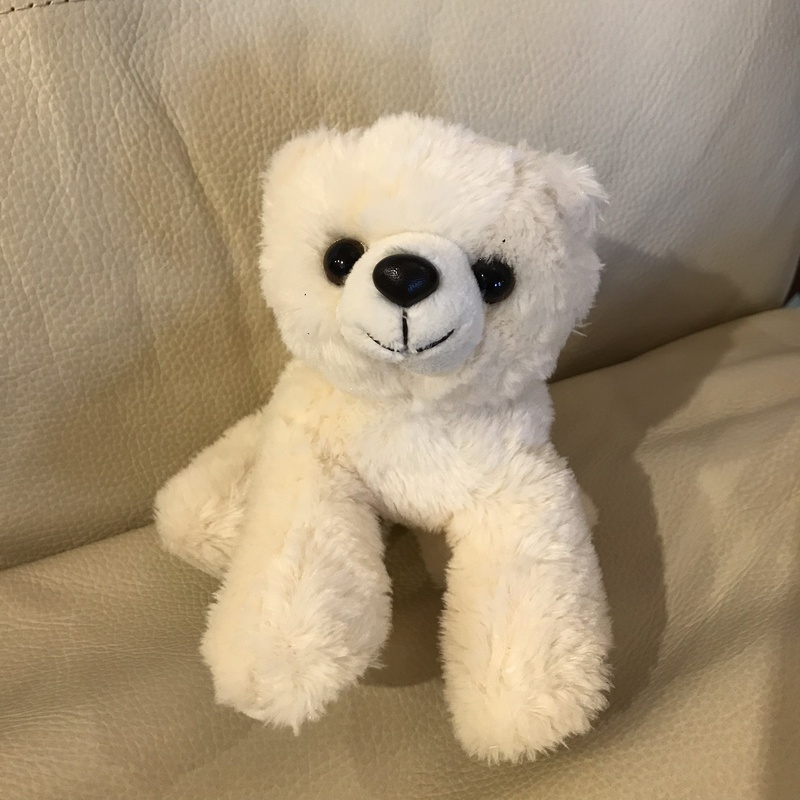 A cute little polar bear cub visitor! NOW LET’S CHAT ABOUT THE BOOK! Isn’t this a stunning cover? The pages inside are just as thrilling. After a savage attack in university, Kira Summers fled to the safety of northern Canada and her work as a polar bear scientists. But when her whistleblower brother dies in a mysterious car crash, she must return home to bury him and pack his belongings. Unaware she’s carrying explosive evidence someone’s willing to kill for, she has no choice but to rely on the one person she never thought she’d see again. Lukas Tanner, a widowed single father of a special needs toddler, moved to Churchill five years ago. As the proud owner of Guiding Star Enterprises, a wilderness tour company, he and his daughter lead a simple life. But when Kira comes back into his world, he realizes God has other plans. Now Lukas and Kira must confront a merciless killer as their past and present collide in a deadly race—a race they must win if they have any hope of a future together. A fast-paced story filled with exciting action as this couple’s safety is threatened…..and strong romantic feelings between them are rekindled! When polar bear research scientist Kira Summers finds out her old boyfriend, arctic rover tour operator Lukas Tanner, lives in the same remote Canadian town, she finds her heart at risk again, as well as her life. Can Kira survive the threats and be given the second chance at love she wishes she could have? 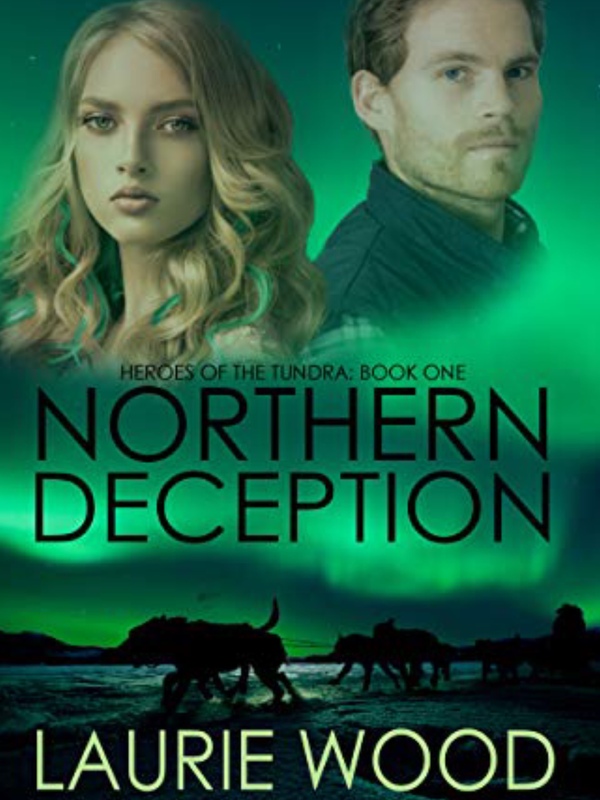 NORTHERN DECEPTION is packed with heart-thrilling moments as Lukas tries to keep Kira safe. Author Laurie Wood knows how to create great suspense to keep us reading into the night. The tension escalated as I tried to figure out who was trying to harm Kira…and why. This book, with its interesting details, provided a fascinating virtual visit to the polar bear land of Churchill, Manitoba, Canada. I was shivering, not just from the freezing temperature, but also from fear of the huge northern bears. The characters were all believable, and I especially liked precious little Sophie. The romance between the couple is sweetly portrayed, with one of the absolutely cutest proposals I’ve ever read…..the perfect ending. If you like romance with strong suspense elements and woven with threads of faith, I highly recommend NORTHERN DECEPTION. I’m counting on more great stories about Heroes of the Tundra from author Laurie Wood. *I received a copy of this book with no requirement to write a review. I’m delighted to offer my honest opinion. This little guy just makes me makes me smile. 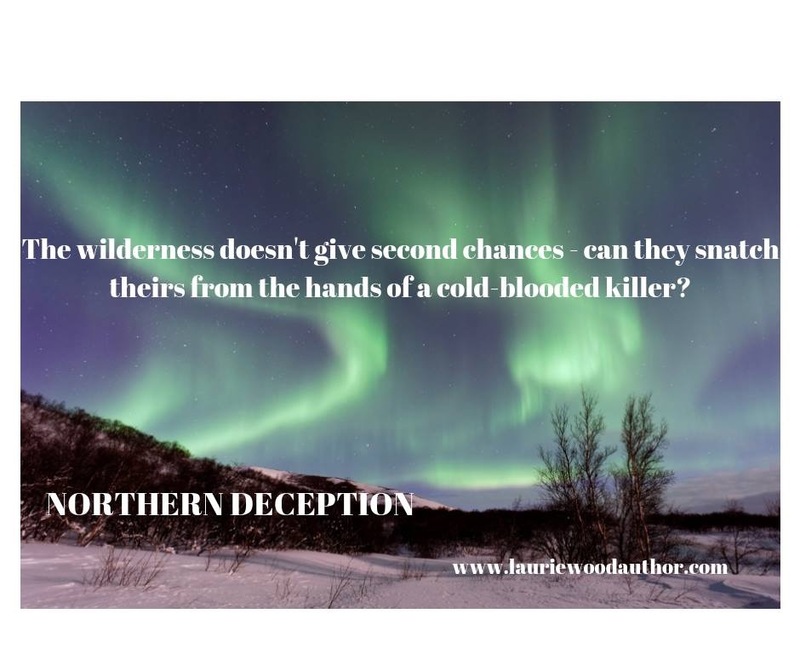 To find out more about Laurie, to sign up for her newsletter, and to get information on ordering Northern Deception, visit Laurie Wood Author website. Turn onto a flour dusted board and knead slightly until dough sticks together. Add more milk if too dry. Form the dough into two balls, then pat into discs roughly 1-inch thick. Cut each round into 8 wedges. Sprinkle with white sparkling decorator sugar. Bake at 400 degrees for 15 minutes or until slightly golden.These can be iced with powdered sugar glaze and more sprinkles added for decoration. Thank you for joining me for #TuesdayTea and celebrating Laurie Wood’s debut book. I hope your week is filled with a bit of time for reading and with many sweet treats as we prepare for the Christmas season! 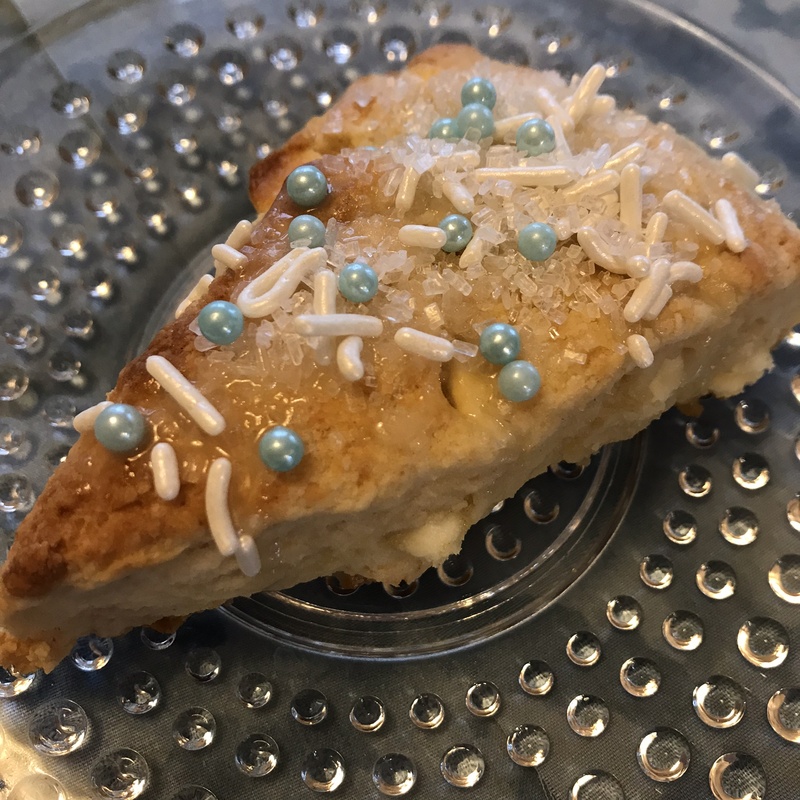 Let’s get ready for #Thanksgivng with my #TuesdayTea featuring maple scones, coffee and #reviews! Welcome to my Thanksgivng Tuesday Tea! We’re celebrating a few romance releases written by some of my favorite inspirational authors! 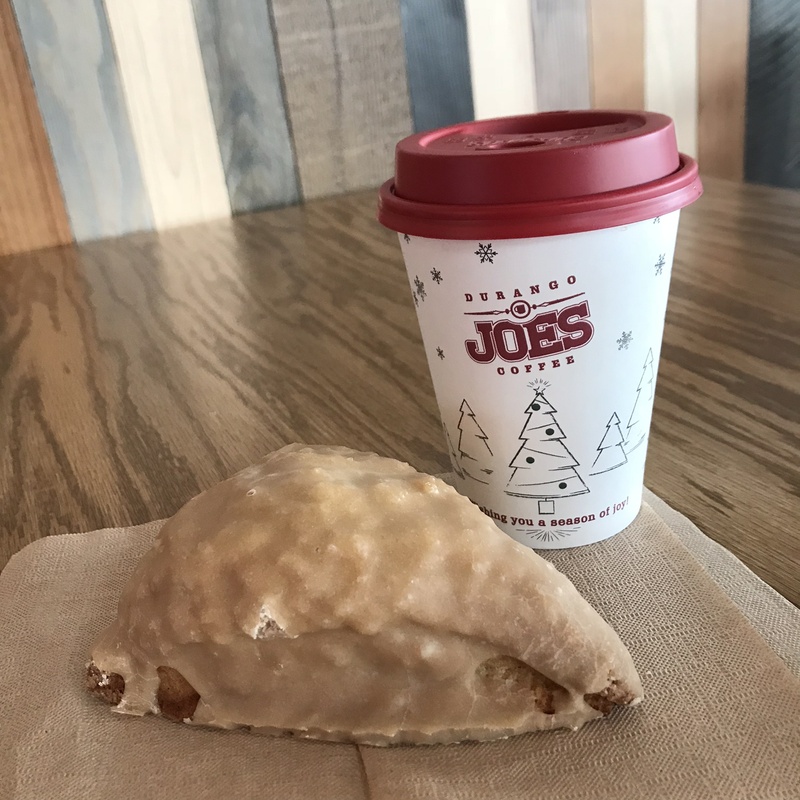 Maple scone with tea or coffee! But first, a tea treat! I’m serving maple scones and your choice of coffee or tea. My husband and I recently had a date at a new coffee shop in town, so I wanted to share. Even though I’m still loving my seasonal pumpkin spice, this taste of maple added some variety to my autumn afternoon. Please enjoy these treats as I review these Christmas-flavored books! A double treat of warm Christmas stories by award-winning authors! I just love reading books filled with the Christmas spirit of love and hope….and these stories by two amazing authors offer all the wonderful “feel goods” of the season. When nurse Kristen Andrews returns to Refuge, Oklahoma, her unexpected reunion with rancher Caleb Girard leads to the warming of old feelings between the couple. Many years ago, Caleb was saved by a good man, Greg Girard, who opened his home years to the troubled youth. Greg now needs help as he deals with kidney failure. Kristen has been hurt by past rejection, so doesn’t want to risk being hurt again. She finds herself together with Caleb every day as she provides dialysis treatment for his dad. I enjoyed the building attraction between Kristen and Caleb. She takes charge, but is vulnerable. He is quiet, but strongly protective. Their developing romance is tender and sweet. A lovely faith thread is woven beautifully through out the story. The Christmas season finds a unique tree gracing the ranch house, and many prayers for miracles are lifted up in the community. A special story! In delightful Ruth Logan Herne style, Falling for the Christmas Cowboy touches hearts as difficult situations are overcome by grace, hope, and a sweet romance. Graphic designer Jessica Lambert meets rancher Ty Carrington when she attempts to restart her life in tiny Shepherd’s Crossing, Idaho. But it’s an awkward meeting for them both. They each have experienced loss, but they handle the grief in different ways. Jessica’s enthusiastic four-year-old daughter, Dovie, brings joy to the pages with her positive attitude. Then there’s the complicating twist I didn’t expect. I love when an author surprises me with a turn of events. And there’s a beautiful Christmas celebration, so full of the spirit of the season with a heartwarming gathering of the townsfolk and a moving candlelit church service. If you like stories of faith and second chances, you’ll be blessed by spending Christmas with the people of Shepherd’s Crossing. A favorite quote: In the space of five minutes, conditions had changed from needy to blessed, and not by her hands. God’s hands. And the kindness of strangers. *I was given a copy of this book with no requirement to write a review. I’m honored to offer my honest review. A Dream Fulfilled, a passionate story of faith, marriage and friendship! Author Julie Lessman really knows how to write romance….including the “just right” amounts of faith and passion! I enjoyed this story about married couple Katie and Luke McGee. Set in Boston in the 1930’s, the struggle to balance family life and work responsibilities is the same as today’s overwhelmed parents experience. The message of relying on faith, friendship, family and forgiveness to overcome difficulties is beautiful. Young mother Katie befriends another mother she meets a nearby park. Their relationship is quite powerful….a test of strength and giving. Besides working extremely hard to provide for his wife and two daughters, Luke tries to help street kids, especially one boy who appears to be going through what Luke did as a child. The relationship between Katie and Luke is threaten by challenging circumstances. At times it seems their marriage could be at risk, but they have a strong bond of love and a passionate faith. celebration will touch your heart! A charming…and delicious….historical Christmas story! Spinster Lena Carver experienced a childhood accident, leaving her feeling undesirable as a potential wife. Generous and hardworking, she assists her brother, the town doctor, with his patients and maintains their home. The doctor finds Wil Bergman along the roadside, unconscious with a broken leg, no possessions, and a dog watching over him. Since he doesn’t remember what happened to him, there is a mystery surrounding his situation. I especially enjoyed all the wonderful characters in this story! Lena is compassionate as she cares for the people of the town, thoughtfully organizing a festive community dinner and preparing Christmas bags for the children. All the cooking and baking she does to nurture others make me hungry for her special treats. Wil is a strong hero as he sweetly courts Lena. I love how the romance unfolds and reveals the hurts of the past, but promises beautiful hope for the future. With Christmas arriving, touching gifts sparkle with love, and acts of kindness bless many. If you like faith-filled stories reflecting the spirit of Christmas, SNOW ANGEL, by Davalynn Spencer, will warm your heart as you experience the holiday during an earlier time. The Good Book was right. There was a time for everything. The firelight danced on her cheeks and in her hair, and for just a heartbeat or two he thought she was the closest thing to a real angel that he’d ever seen. PLUS I’LL ADD A COUPLE OF UPCOMING INSPIRATIONAL ROMANCES I’M ANTICIPATING…. NORTHERN DECEPTION by Laurie Wood is releasing December 4, 2018. This story, set in Canada’s polar bear region, is filled with exciting suspense. Watch for my upcoming review! You can find out more at Laurie Wood Author website. And be watching for HER HOPE DISCOVERED by Cynthia Herron. The small town of Ruby, Missouri, is guaranteed to warm your heart. Find out all the news by checking Cynthia’s website at Cynthia Herron author website. Thank you for joining me for tea and treats. I hope your Thanksgiving…or your weekend for my out-of-country readers…is filled with blessings! Please join me next week for my November word-of-the-month devotional about HANDS. Welcome to my #TuesdayTea review of an intriguing debut novel by Laura Conner Kestner. Isn’t the cover stunning? I completely enjoyed this visit to Moccasin Rock, Texas. The assorted characters are all so captivating. And following the journey of Caleb and Abby as they fall in love is fun and unpredictable. I’m serving POTATO Chip Cookies with warm spiced apple cider today….the cider because it’s autumn and you’ll find out why I’m offering POTATO chip cookies as you read Remember Texas. I’ll include my mother’s recipe for the cookies. Award-winning fiction. Abigail Horton’s life is turned upside down during the last night of a week-long revival when her father—believed dead—shows up in the custody of a Texas Ranger. Abby is thrilled to see him, and equally devastated to learn he’s been living the life of an outlaw. Texas Ranger Caleb Calhoun stops in Moccasin Rock to let his prisoner, Bob Horton, visit briefly with family before transporting him to Austin for trial. Caleb takes a room at the family’s boarding house, planning to be in and out of the small town by morning. But within hours he’s kissed Abby Horton, made an enemy of her naïve suitor, and let his prisoner escape. As Caleb searches for the missing outlaw, and Abby struggles to keep the man’s whereabouts a secret, they also battle a growing attraction to each other. Throw in a Calhoun family mystery, an elderly preacher on a mission, an old flame of Caleb’s, a secretive spinster, a team of surveyors, and Abby’s mother and brother—and you have a compelling story of faith, family and forgiveness. Remember Texas is such an engaging story! I loved it! Romance and intrigue fill the pages of a fast-paced historical book set in early Texas. This book is an award winner, and I certainly understand why! Caleb Calhoun is a Texas Ranger on a mission to bring an outlaw to justice when he meets Abigail Horton in tiny Moccasin Rock, Texas. The town setting, with its interesting assortment of townsfolk, invites you into a place of warm relationships, intricate family bonds and some dangerous elements. The tangles of the situations the various characters find themselves in are all so believable. The story moves along quickly with plenty of action and lots of questions about unusual events surrounding the area and its residents. The hero’s actions caused my heart to warm as he falls for the reluctant heroine during some lovely romantic moments. I really enjoyed all the fascinating characters as they transformed during the course of the story, some from quite unlikeable individuals turning into delightful additions to the group. I especially like the way the author brings all the intriguing details together by the end for a very satisfying conclusion, including a lovely proposal and beautiful epilogue. More stories by author Laura Conner Kestner are much anticipated! 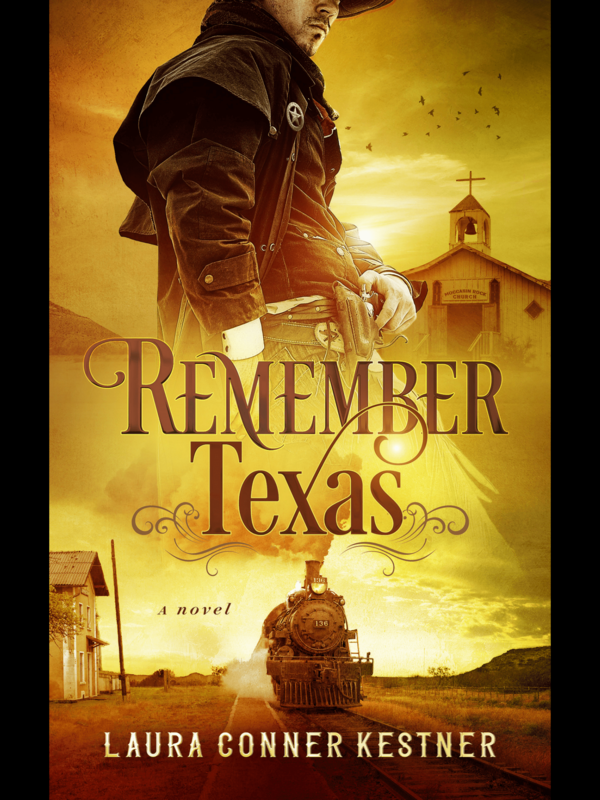 If you enjoy faith-filled historical romance, I believe you will be truly engaged with Remember Texas, a fun book to read! Then add to the sugar/egg mixture. Drop drop dough by tablespoonful-sized scoops on to an ungreased cookie sheet. Bake for 10 to 12 minutes at 350 degrees. Watch carefully so the cookies don’t burn. Enjoy! Thank you for visiting with me today. May you be blessed with the treasure of encountering interesting places and books which bring the past alive. *I appreciate comments. Your comment will appear after moderation. I apologize for delays. A #TuesdayTea (or milkshake) celebrating Ruth Logan Herne books! 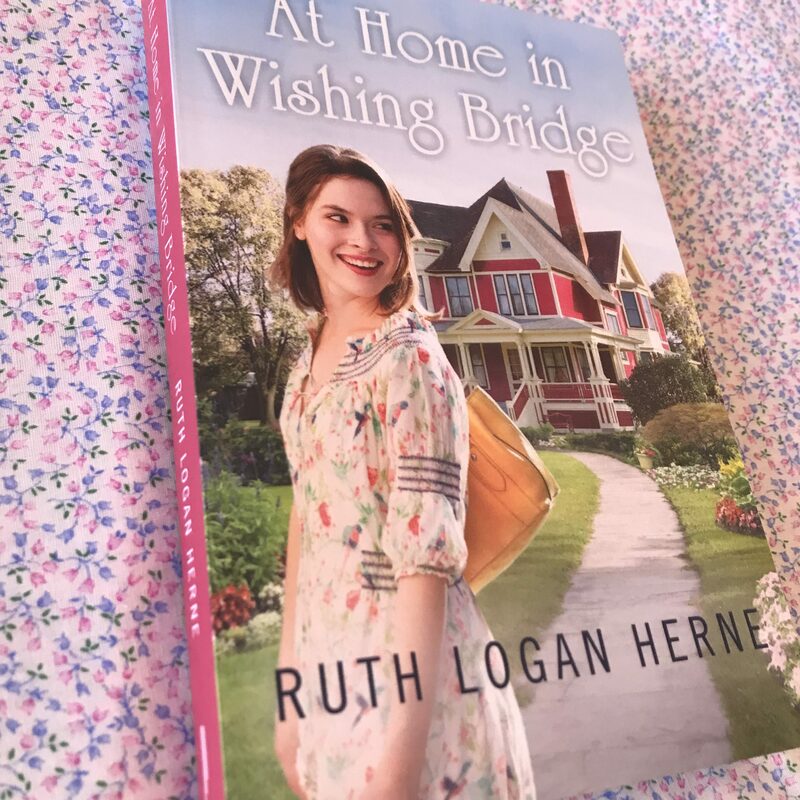 Welcome to my #TuesdayTea celebration of author Ruth Logan Herne’s newest release, At Home in Wishing Bridge. We’re also celebrating her Christy Award nominated book, Her Secret Daughter. The Christy Award honors the very best of Christian books. Congratulations, Ruthy! In Wishing Bridge stories, there is a small town ice-cream stand where the villagers meet to satisfy their frozen treat cravings. Near her own town, Ruthy appreciates the selection from Abbott’s Frozen Custard. Knowing hometown shops are valued by the author, I’m serving milkshakes today (instead of tea) from the Vanilla Moose, our local spot for frozen treats. Choose any flavor you’d like with all kinds of mix-ins. Last weekend was closing day for the season, so my husband and I stopped by Saturday evening. I indulged in my favorite shake…..chocolate with brownie bits and almonds. Mmmm! 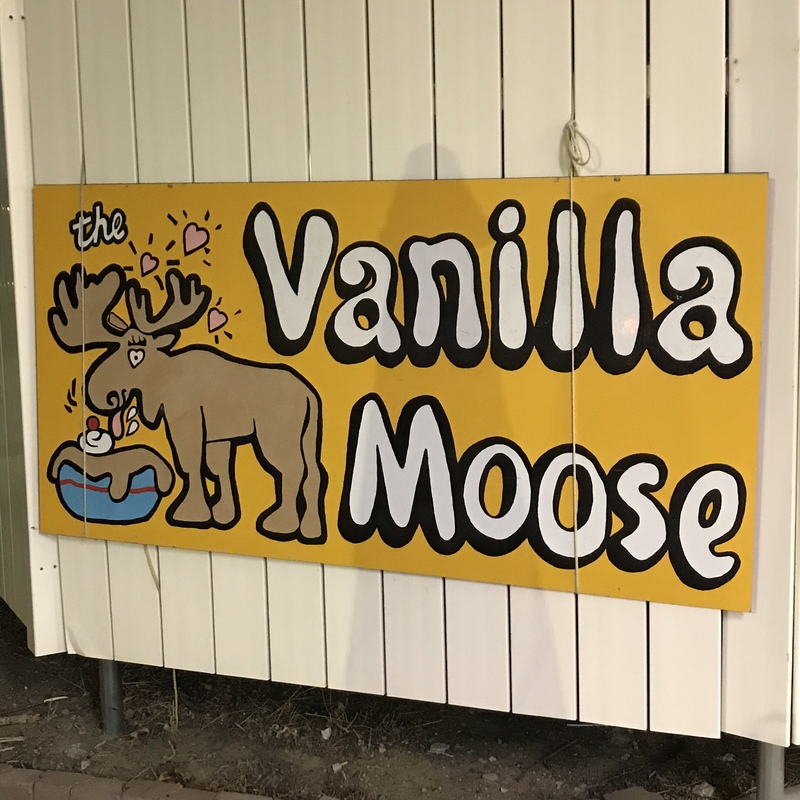 Our local go-to frosty treat spot…the Vanilla Moose. 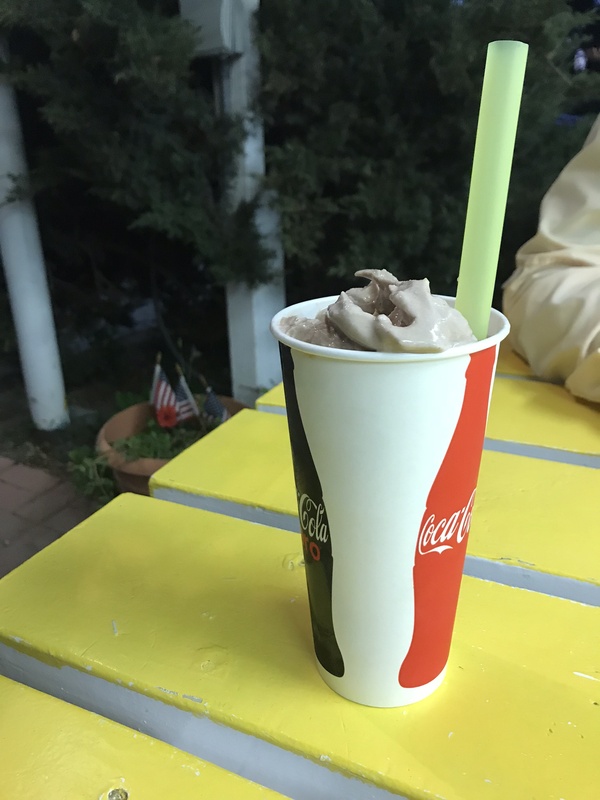 My favorite shake…chocolate with brownie bits and almond pieces. Now to chat about Ruth Logan Herne’s heart-touching stories! The first review is of her newest book which RELEASES TODAY! Such a delight to come back to Wishing Bridge…a village of faith, hope and love! After three friends, brought together as teens in a home for troubled youth, find themselves reunited years later in the small village of Wishing Bridge, New York, their ties deepen as they help each other find happiness. This second story in Ruth Logan Herne’s heart-touching series featuring this charming town finds nurse practitioner Thea Anastas offering her skills at a medical clinic where Ethan Brandenburg, the temporary doctor, has his hands full with both the patients and his recently orphaned niece and nephew. She’s ready to leave for the big city. He’s anxious to move to his promised research assignment in Chicago. However, “accidents of timing or God’s perfect timing” keep them working together in Wishing Bridge. I completely enjoyed At Home in Wishing Bridge as this couple confronted their past issues, reluctantly becoming aware of their feelings for each other. They both had difficult childhoods, feeling unloved and worthless. It was interesting to see how they approached rising from extreme pain to lift themselves, with the help of friends, to carry on and grow in the right direction. I felt like I was part of this community with lovable folks who struggle with issues we all face. Good solid advice is sprinkled throughout the pages, bringing your heart closer to each individual as you become involved with the challenges they face. Max is an absolute angel as he generously offers help to others…. a great example of how we all should live, treating people with kindness and respect. Eight-year-old Mara tugged at me as she tried to cope with the loss of her parents, not understanding how her life could ever feel normal again. But as the story unfolds, each hurting person works toward a sweet resolution. A beautiful story of hope…hope and second chances after difficult situations….the kind of story author Ruth Logan Herne does so well, bringing faith and love to people through her books. Here’s my review of the first book in the series. A comforting small-town story of second chances and trusting friendships….both old and new. As Christmas approaches with a blinding blizzard, Kelsey McCleary’s arrival in the small town of Wishing Bridge, New York, is dramatic. Stranded in a tiny community with a new baby and limited funds, she is embraced by the warmth of the village and by the support of two dear friends who come to help after receiving her urgent S.O.S. call. Police officer and rescuer Hale Jackson is a local guy who returned to his hometown after disappointments in his pro football career and in his personal life. These two become involved amid the winter weather trials and the unraveling of a mystery. Why is the name of Wishing Bridge familiar to Kelsey? What will she find in this little community tucked into rural New York? This new book by Ruth Logan Herne is a wonderful woman’s fiction story about the strength forged through difficult circumstances with the support of friends…both new and old. There is romance, along with the author’s signature style….small-town warmth, endearing characters, and perfect portrayals of children. Sweet baby Hayley is so huggable! Touches of faith and compassion are sprinkled throughout the pages, making Welcome to Wishing Bridge an engaging story of starting over and sparkling new beginnings. I enjoy the endearing stories set in small town America with the values of helping others and of working hard to make the world better. I’m glad to know there will be more to come from this charming town….where wishes come true and prayers are answered. This is my review of the Christy Award nominated book! This book is soooooo good…..filled with the beauty of loving sacrifice! As with any book by author Ruth Logan Herne, keep a box of tissues nearby because there are moments of tears…..tears of empathy and tears of joy. Yes, a great book! Sacrificial love themes are a favorite of mine, and Her Secret Daughter is filled with that kind of love….giving up your own desires to choose the best situation for others. Josie Gallagher has worked hard to put her difficult past behind her, returning to the town of Grace Haven to live her dream of operating her own barbecue restaurant. But all her careful plans are swept away when handsome Jacob Weatherly arrives in town with Addie, his adopted daughter. My heart hurts for Josie, knowing she dealt with some hard issues as a young woman. She both accepts and gives grace as she builds a new life for herself. She is strong in her determination to make things right. Jacob is my kind of wonderful….a caring daddy and a morally strong man. He works hard to balance his work as a development executive with his most important role of providing love and a normal life for his adopted daughter, his sister’s child. And this child, Addie, is so fun, bubbling with enthusiasm. She dances on the pages! Her Secret Daughter is so engaging, with many surprises along the way, as Josie and Jacob show that the strength of love can make the world better….and open a path to an amazing happy ever after. Did I mention Kleenex is needed? And with God on their side, they’d make everything work out. He’d recognized the precious gift from God right away, almost as if it was somehow meant to be…and he’d been cherishing that gift every day since. Ruth also had a Love Inspired cowboy book published this year. A gripping romance…..hearts are challenged and life is experienced on a beautiful western ranch! In her books, author Ruth Logan Herne tackles emotionally difficult subjects with compassion and grace, and this series debut, Her Cowboy Reunion, is just such a story. Lizzie Fitzgerald and Heath Caufield had a past relationship. It didn’t end well. When they find themselves working together on an isolated Idaho ranch near the downtrodden community of Shepherd’s Crossing, tensions flare and hearts are challenged. My heart and emotions were held captive by the difficult situation the couple faced as they struggled with trust and their feelings for each other. Adding to the deepening of the story, I was fascinated with the depiction of ranch life on a large western spread and enchanted by the exuberant little boy, Zeke, and by the dear woman, Corrie. As the author does so well, this book has touching offerings of family wisdom along with gentle guidance for reviving community spirit. But best of all, I love a romance where love can conquer overwhelming difficulties…with faith as the guide toward forgiveness….and this story takes a heaping portion of forgiveness for past hurts and misunderstandings, but a beautiful conclusion awaits at the end. Since I’ve lived in many small towns of the west, I was immediately invested in the concerns of Shepherd’s Crossing and look forward to seeing the community develop as the town faces the challenges ahead. I’m sure we’re in for more delights as the folks come together in hope, faith and love….with the greatest of these being love….in all its various expressions. A heartwarming book! ~~It wasn’t about the money or the power of heading up a high-priced property. It was about taking the right trail to get where you were going. *I was given copies of all these books with no requirement to write reviews. I’m delighted to offer my honest opinions about these stories. 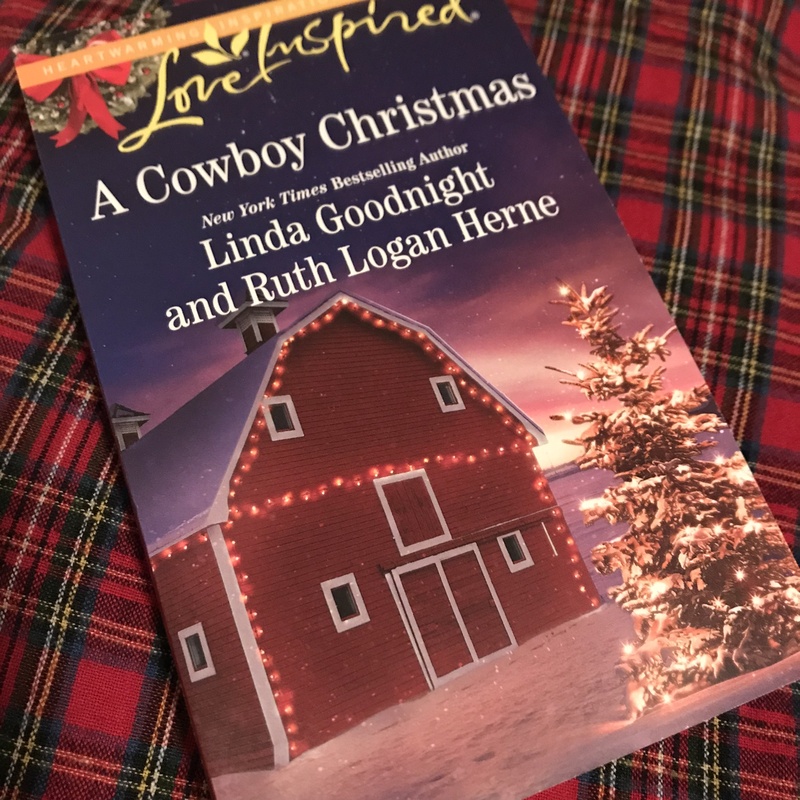 And in other book news, December brings a Love Inspired book duet by Linda Goodnight and Ruth Logan Herne…A Cowboy Christmas. Isn’t this cover overflowing with Christmas sparkle? Thank you for joining me for #TuesdayTea….or….#TuesdayIceCream. May you enjoy the treasured blessings of stories which warm your heart! No computers were harmed in the 1.276 seconds it took to produce this page.